I'm trying to avoid making too many political statements on this blog, but since it is pride month I thought I'd share the following petition form to get the San Jose Sharks to be the first NHL team to make or sponsor an "It Gets Better" video. Several Baseball teams (including the Giants) already have such videos. Here is a link to the petition. It looks like several of the retail spaces in the @First development (First St. and 237) are just about done. 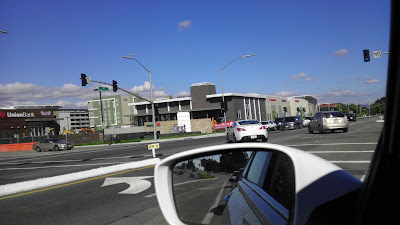 There are signs up for Union Bank, Panda Express, Five Guys, and Chipotle. There are also 2 buildings going up fast right next to the Target. San Pedro Square Market has an Official Launch Date: September 10! The market is opening just in time to catch some warm summer weather! September 10 is the official date, although there will be soft openings for several vendors before then. I also wouldn't be surprised if there is an epic SJ Eats event to coincide with the opening. Also, check out this great blog post about the market at the Silicon Valley Lofts & Condo's blog right over here. CORRECTION: This is not the official launch, but a sneak preview! San Jose, Calif., -- Enter Music Publishing, publishers of hip drumming magazines online and offline, isn’t just obsessed with selling magazines. The company has a strong commitment to the community and drummers in need. Last year, Enter Music Publishing, in conjunction with the San Jose Jazz Festival, sponsored Rhythm Night, a benefit for the family of deceased Little Feat drummer, Richie Hayward. The night was a tremendous success with more than 500 drummers and fans attending. This year, Enter Music Publishing is sponsoring its second annual benefit, DRUM! Night, which promises to be an exciting drumming festival with a diverse lineup of drummers and percussionists. On Friday, August 12, drummers will descend on the San Jose Repertory Theatre in the heart of Silicon Valley to witness an evening of amazing drum clinics and performances by Terry Bozzio (Frank Zappa, Missing Persons, Jeff Beck), Thomas Lang (Spice Girls, Tina Turner, Stork), and Santana’s fiery percussion section: Karl Perazzo & Raul Rekow, with special guest Armando Perraza (formerly of Santana). The event will actually be kicked off at 4:30 in the afternoon when Street Drum Corps puts on a street concert outside the venue. All proceeds generated by 2011 DRUM! Night will be donated to the Performing Arts Music Program at Lincoln High, a San Jose magnet school. With over 40 course offerings in dance, music and theater arts, more than 900 Lincoln High students of all ability levels study and learn to attain the highest levels of achievement. attendees to have their stick grips analyzed and tuned-up by local drum teachers, witness music demos, test new drum gear, and get in on a special autograph session featuring Brian “Brain” Mantia (Guns ’N Roses, Primus), Jimmy DeGrasso (Megadeth, Alice Cooper), and other notable Northern California drumming dignitaries. DRUM! Night raffle tickets will go on sale shortly. Entrants for a chance to win a full custom drum kit featuring Mapex drums and Sabian cymbals, as well as a host of additional prizes from companies like Gretsch, DW, LP, Gibraltar, Vic Firth, Craviotto, Remo, Vater, and more. Winners will be drawn and announced at the close of the show. All proceeds go to Lincoln High. Like last year’s Rhythm Night, DRUM! Night will help kick off the 22nd Annual AT&T San Jose Jazz Festival, one of the largest open-air jazz festivals in the world. SJJF closes off the entire downtown area, erects multiple outdoor stages, and draws up to 100,000 music lovers who converge from Friday afternoon to Sunday evening to enjoy jazz, blues, salsa, Latin, R&B, electronica, and many other forms of contemporary music. General admission tickets for DRUM! Magazine Rhythm Night are $20 apiece (each additional ticket is $15). Ticket ten-packs are available for $125. Premium tickets are available for $25. Cosponsors for DRUM! Magazine Rhythm Night include Roland, DW, Sabian, Remo, LP, Mapex, Vater, and Vic Firth. For additional information, please visit www.drummagazine/drumnight. Founded in San Jose, CA in 1992, Enter Music Publishing, Inc. is a leading publisher of hip, drum/percussion magazines, with distribution in 40 countries. DRUM! is the flagship publication of Enter Music Publishing, Inc. and continues to set the industry standard for editorial quality and innovation. Enter Music Publishing, Inc. also publishes great content on its website, drummagazine.com. Over the company’s history, Enter Music Publishing has pressed other well-respected publications, such as How To Play Drums, and TRAPS magazine. The company’s mission is to be the best source of drumming news and info on this planet and others as they become populated. The company’s founders, Phil Hood and Andy Doerschuk, are well-respected drum industry veterans with more than 50 years of experience in the field. I'm glad I stumbled upon this one... looking forward to next year's event! 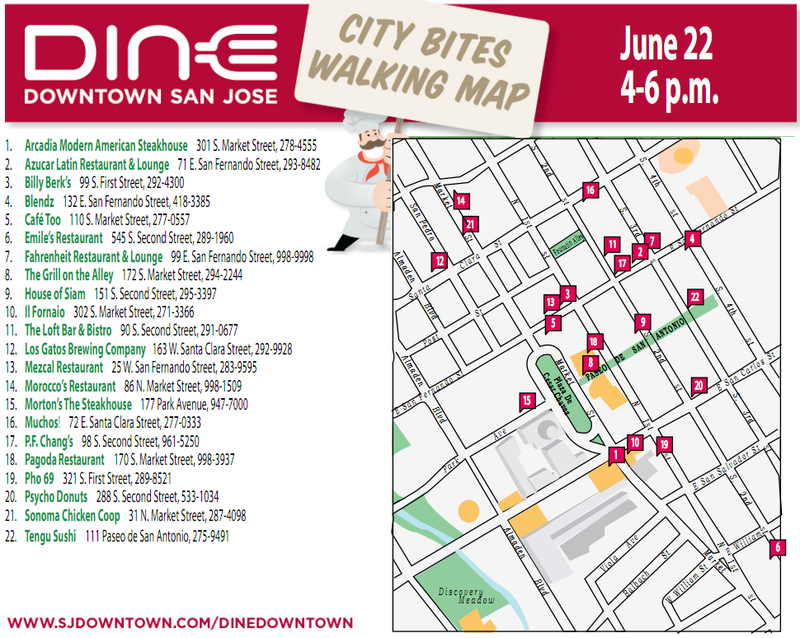 Dine Downtown San Jose is back for 2011 and has an outstanding lineup of participating restaurants! Each venue will offer a $20, $30, or $40 fixed price three course menu. I'll also point out the the Capital Club is a member-only club, so restaurant week is the only time of the year where anyone can go up and sample their dining room on the 17th floor of the Knight Ridder building. 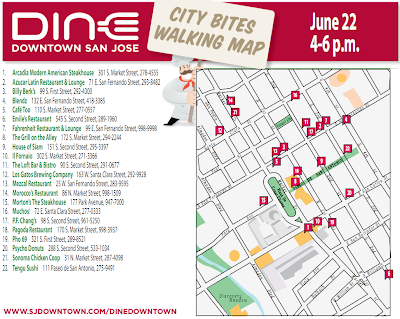 Dine Downtown kicks off today and you can find the participating restaurants below. For more details on all of the restaurants and menus, click here. Music in the Park Continues on Thursday! Up this week for Music in the Park is a Beatles tribute band from Santa Cruz / Monterey called the White Album Ensemble. The show is completely free and well worth a trip to Plaza de Cesar Chavez. See below for more information on this week's band and the full 2011 lineup! They will perform "Beatles and Beyond" a hodgepodge of Beatles classics through the ages, with some solo favorites too. Hits such as Imagine, Maybe I'm Amazed, My Sweet Lord and Dark Horse. Seventh Music in the Park appearance in eight years, taking a year off in 2010. At Music in the Park, WAE covered The Beatles' "White Album" in 2004, "Sgt. Peppers' Lonely Heart Club Band" in 2005, “Rubber Soul and “Revolver” in 2006, “Abbey Road” and “Let It Be” in 2007, “The White Album” again in 2008 and “Across the Universe” in 2009. The band consists of top Santa Cruz and Monterey-based musicians and vocalists for bands such as the Doobie Brothers, Quicksilver, Snail and The Little River Band, including: Dale Ockerman keyboards; Ken Kraft, guitarist and vocals; Richard Bryant, vocals; Tiran Porter, bass; Timb Harris (violin and trumpet). Omar Spence, son of Moby Grace's Skip Spence, will perform some of the vocal work. Not branded as a look-alike or tribute band … more like a symphony or orchestra playing timeless pieces. June 9: The Original Stone City Band (Funk / R&B - Rick James' original band). With So Timeless. Sponsored by KBLX 102.9FM. June 23: White Album Ensemble (Beatles tribute). Two full sets. WithForever Young. Sponsored by 94.5 KBAY. June 30: Natural Vibrations (Hawaiian Reggae / Rock / Soul). Opening: The Bangerz. Sponsored by LIVE 105. July 7: Led Zepagain (Led Zepplin Tribute). Supported by ZeBop!. Sponsored by Classic Rock KFOX 98.5 / 102.1. July 14: Neon Trees With 5606. Sponsored by Mix 106.5 and S*ALT. August 18: Sergent Garcia (World / Latin / Reggae). With Los Hot Boxers. Sponsored by 93.3 LaRaza.